Play-Doh 4pks only $1.49 Each w/ Coupon! 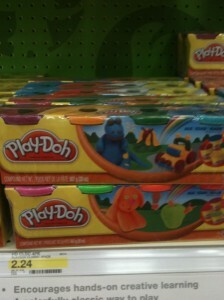 You can get a great deal on Play-Doh 4-packs at Target with this coupon! = $4.08, or $1.49 per pack! NOTE: Reader Kelly said her local Dollar General sells these for $2 each, which would make them only $1.33 each! Has anyone else seen these at DG?